It's been at least a couple years since I've been to Blowfish - King and Bathurst was just a little far for us to stop by ad hoc...but we were happy to find a new location on Bay and decided to check it out. I initially thought that Blowfish had simply moved - seemed odd to give up the great King/Bathurst building, but a quick look at the website today confirmed Bay is indeed just a second location. Congrats to Blowfish on the expansion then! Similar to the King/Bathurst location, Blowfish on Bay is very modern and chic. We were seated by the giant window facing Bay, which was almost a little odd as it felt soo close to the sidewalk. We browsed through the menu of assorted sushi/sashimi, cold and hot plates and various rolls. 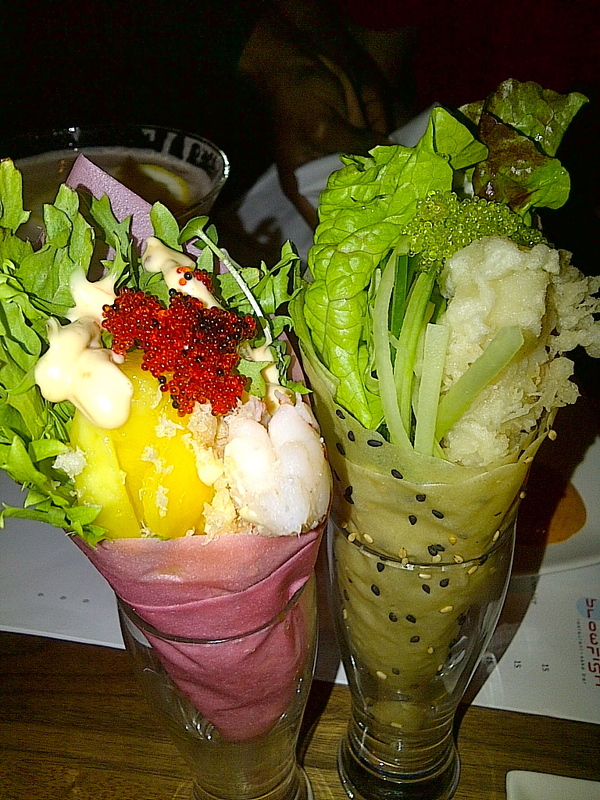 If you have not been to Blowfish before then you need to know that the ebi shooter (giant hand roll served in a shooter glass) is FAMOUS - giant tiger prawn with mango, avocado, tobiko and a whole lot more all wrapped in a unique soy paper. My first visit to Blowfish years ago was a stop at the bar just to have a drink and an ebi shooter. The ebi shooter did not disappoint and was as tasty as I remembered. It was so good we ended up ordering a 2nd, but also tried the Bob shooter, a slight variation with tempura tiger prawn instead and wrapped with sesame soy paper. 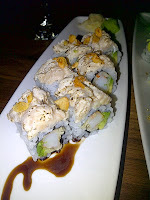 The "original" ebi shooter is still best, but I liked the sesame soy paper better. Other rolls that tempted us were the golden king crab roll, which was tasty but the pine nuts sounded better in concept than in taste - overwhelmed the crab a bit, the truffle albacore tuna roll, which was our favourite although very little truffle oil taste, and finally the spicy tuna roll with rock shrimp, which was the Blowfish variation of typical ebi mayo. Rolls are definitely the highlight at Blowfish, some unique combination of ingredients and flavours. We also had the wagyu beef carpaccio, which was drowning a bit in ponzu sauce (a little less would have been better for the very thin beef) and the miso marinated lamb chops, and lobster and shrimp dumplings (kind of like expensive har gow for dim sum fans out there). All the food was ok, but I'd stick with the rolls, which I think Blowfish does best. Blowfish is a chic and sophisticated place to have Japanese fare, even if you're not interested in a full meal (it is a bit of a splurge), it's worth a stop by for some tasty saketinis and of course, an ebi shooter.